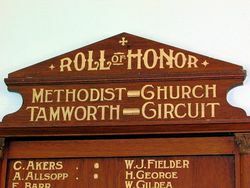 Two wooden honour rolls commemorate those from the Tamworth Methodist Circuit who served in World War One. Two months ago the trustees of the Tamworth Methodist Church decided to perpetuate the memory of the gallant men who went out from the Tamworth Circuit to serve the cause of Empire and humanity in the great war now happily ended. With that end in view arrangements were made for three stained glass memorial windows, two of which were the gift of Mr. R. Pryor, of Winton, to be placed in the front of the Tamworth Methodist Church. 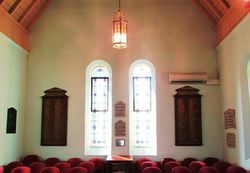 It was also decided to place two Maple Honor Boards in the church, on which the names of the 160 men who heard the call of duty should be inscribed. Daily Observer (Tamworth, NSW), 26 July 1919. The members and adherents of the Methodist Church will be delighted to hear that their former minister, who went from Tamworth as chaplain to the forces two years ago, Captain Chaplain W. Mills Robson, has consented to conduct the Tamworth Methodist Church anniversary services on Sunday week, morning, afternoon and night. At the afternoon service the memorial windows and honor boards will be unveiled, and it is expected that the church will be all too small to hold the large congregation that will assemble at this important and interesting service. 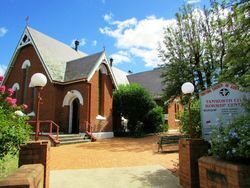 Arrangements are being made for the country services to be held in the morning or evening, in order that all the country friends may be able to attend the afternoon service in Tamworth. Daily Observer (Tamworth, NSW), 2 August 1919.